Singapore, 1 March 2011 - The 2011 FORMULA 1 SINGTEL SINGAPORE GRAND PRIX is proud to announce LINKIN PARK as the headlining band on Race Day, September 25th on the Padang Main Stage in Zone 4. Grammy-award-winning LINKIN PARK have sold over 50 million albums worldwide since their debut album, Hybrid Theory was released in 1996. Their latest release, A Thousand Suns, debuted at the top of Billboard's Top 200 album chart and has produced two #1 singles. A Thousand Suns marks the 3rd consecutive Linkin Park album to reach number one. 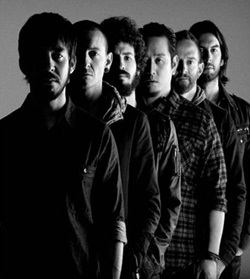 Produced by Rick Rubin and Linkin Park co-lead vocalist, Mike Shinoda, the album has been described as a psychedelic journey that explores the conflict between technology and humanity. For the past six months, LINKIN PARK have been on the road in support of their A Thousand Suns World Tour. Before coming to Singapore in September, they will also headline the Download and iTunes Festivals in England. LINKIN PARK’s live show is a transformative multi-media experience, with visual technology that befits the power of the music. The band was voted ‘Best Live Act’ at the 2010 MTV European Music Awards. The setlist will combine the biggest hits of the band’s career, as well as new material from A Thousand Suns. With more acts to be announced, fans can look forward to a global sporting event that offers spectacular Formula One race action and the world’s best entertainment, all for the price of one ticket. Tickets will be available for sale online (www.singaporegp.sg), via the ticketing hotline +65 6738 6738 as well as all SISTIC outlets from 3 March 2011, 0900hours (GMT +8 hours). Please visit www.singaporegp.sg for a complete list of ticket prices.